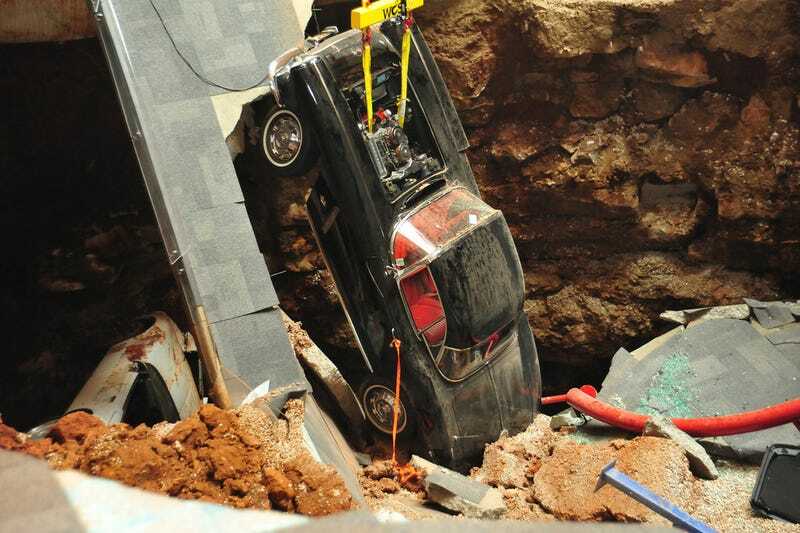 When last we heard about the sinkhole that engulfed part of the National Corvette Museum in Bowling Green, Kentucky, museum officials decided to keep it open as a tourist attraction. Today, however, they changed their minds, and the sinkhole will be no more. The AP reports that the museum's board of directors voted to fill in the entire hole that opened up beneath part of the museum in February, damaging or destroying eight special Corvettes of various vintages. It's a surprising change of heart from June, when the board said it would keep the sinkhole open because it unexpectedly proved to be a boon to museum attendance. While the museum has the noble job of preserving the history of America's sports car, it has struggled financially at times, and the sinkhole was seen as an asset because it was attracting more visitors than just the car crowd. Attendance was up a good 66 percent for a while. But the AP reports the board decided that keeping the sinkhole open wasn't financially viable, thanks to the additional safety costs involved. "We really wanted to preserve a portion of the hole so that guests for years to come could see a little bit of what it was like, but after receiving more detailed pricing, the cost outweighs the benefit," said museum Executive Director Wendell Strode. To keep part of the hole, workers would have installed 35-foot-tall retaining walls and inserted beams in the hole to prevent future cracking, said museum spokeswoman Katie Frassinelli. Costs mounted to about $1 million — double earlier estimates — due to safety and humidity-control features. Another worry was ongoing maintenance costs if a section of the hole stayed open, they said. "It just wasn't practical to do it," Strode said. It's kind of a shame since the sinkhole could have been an interesting and unusual attraction, and it clearly helped their bottom line for a while, but the board's decision is totally understandable. Instead, crews will fill the hole with rock, then install steel casings and a concrete pillar to provide more support under the floor. As for the damaged cars, Chevrolet will restore three of them, and the other five will be displayed in their present condition in the museum. General Motors is also providing $250,000 to help the museum recover from the sinkhole, which is a pretty stand-up move on their part if you ask me. Fare thee well, Corvette Museum sinkhole. You were fun for a time, but I really hope for the museum's sake that you don't come back.